The Toyota Prius continues to rank high in reliability. The Prius was first released in Japan in 1997, in 2000 the Prius was available worldwide. Over 5 million Toyota Priuses have been sold worldwide, making it the best-selling hybrid vehicle globally. More than 2 million Priuses have been sold in the United States. The Prius has been Japan’s best-selling car since 2009. It’s no secret that Americans have a long fascination with the internal combustion engine and many of us were reluctant to embrace the hybrid technology, but the Toyota Prius has set the standard and has been embraced by the public. Whenever new technology reaches the masses there is a long list of skeptics that will wait a few years before purchasing, the Toyota Prius is now on the short list. Using data from over 36,000 Toyota Prius hybrids, Consumer Reports has given the Toyota Prius high marks for reliability. Prius owners also experience low ownership cost due to few repairs. One of the questions that potential Prius buyers raised was the longevity of the battery, skeptics worried about the length of the battery life and its cost to replace it. It is not uncommon to find Prius owners with over 200,000 miles on their cars, that are using the same original battery. Many Prius-driving Taxi drivers have logged over 200,000 miles on their cars and reported no decline in vehicle performance. The Toyota Prius is now in its fourth generation model and has many happy customers throughout the world. Toyota of El Cajon had the opportunity to profile one of our customers Dana Stevens, who owns a 2006 Prius with 250,000 miles watch to her story. The 2016 Prius has been redesigned for better aerodynamics and fuel efficiency and promises to raise the bar even higher for hybrid vehicles. If you’re in the market for a reliable fuel-efficient car then test drive the Toyota Prius. Written by Toyota of El Cajon. The Padres, San Diego River Park Foundation, and Toyota of El Cajon Team Up! Forester Creek and the San Diego River require attention in order to keep it clean and Toyota of El Cajon has graciously offered their time to do just that! The San Diego River Foundation, Padres Volunteer Team presented by Toyota and Toyota of El Cajon will be working together on June 6th to create a better quality of life for our community through the conservation of San Diego River’s 52 mile river ecological, cultural and recreational resources. Let’s help make a difference as Toyota of El Cajon partners with the San Diego Padres and The San Diego River Park Foundation! Saturday, June 6th, from 9AM-11AM we will be hosting a river clean up exclusively for Toyota of El Cajon/Toyota Certified Center of Santee employees, friends, and family! Simply visit www.padres.com/volunteer and during the registration process be sure to choose Toyota of El Cajon as your group. If you have any questions or would like assistance with registration, you may contact Dana Sterpe at 619-270-3095 or dsterpe@toyotaofelcajon.com. DESCRIPTION: Padres Volunteers from Toyota of El Cajon will help remove trash and debris from Forester Creek in Santee. This is a great activity for environmentally-conscious individuals interested in clean water and a clean habitat for the plants and animals that call San Diego’s creek and river system home. PARKING: Parking is free and readily available in the parking lot at the address provided. ARRIVAL: Please check in with Allison near the Padres Volunteer Team and San Diego River Foundation set up tent. She will be there to welcome you and get you signed in. ATTIRE: Please wear your Padres Volunteer Team T-shirt, long pants, and closed-toe shoes. No flip flops or open toed shoes are allowed for safety reasons. Unfortunately, volunteers may be turned away if not wearing closed toe shoes. Please also be sure to dress in clothes that can get a little dirty. Note: If this is your first event, you will pick up your tshirt upon check in. MISC: It is important to be prepared to spend time outside walking along the creek as be able to bend over to pick up trash as you see it! Have fun! We will have waivers available at the check in location, but if you prefer to complete in advance, please click on the download links and print below. CONTACT: Please call 619-346-0002 with any questions. We look forward to seeing you there! A production ceremony was held at Toyota’s Motomachi Plant in Toyota City, Japan today to mark the milestone for the future of vehicles with the production of the Toyota Mirai. The Motomachi Plant has over 50 years of production under its belt and has produced other great vehicles such as: “Corona”, “Soarer”, “Supra”, “RAV4”, and the Lexus “LFA” supercar – among others. The highly skilled craftspeople of the Motomachi Plant are no stranger to an intricate building process, hand-building the 500 series limited Lexus supercars to some of the highest standards ever seen in the industry. The same detail oriented craftsmanship will be shining through the production of the Toyota Mirai with an estimated 3 units produced each day. Take a look at the care used during the entire manufacturing process of the Mirai. For more information visit the Toyota Global Newsroom. Our loyal customers know us here at Toyota of El Cajon as the friendly dealership that they can count on for generations. We take great pride in the satisfaction we are able to deliver with our services and products. However, what most of you don’t know is that our dedication to the community goes beyond our cars! When we had the opportunity to move into our current building in 2009, we wanted to do more than provide great cars and truly exceptional services to our friends and neighbors. We wanted to give our future generations the opportunities they deserve. How do we do that, you ask? Well, we got ourselves and our buildings LEED Certified! So what is LEED? What does it mean to be LEED Certified? Our efforts don’t stop there! You can also see for yourself in these informational signs around our dealership locations at El Cajon and Santee! Toyota of El Cajon is the first and only green dealership of all Southern California, we raise the bar to achieve the highest level of guest satisfaction for you and your family! Being green is just one of our many ways to make positive contributions to our neighborhood! 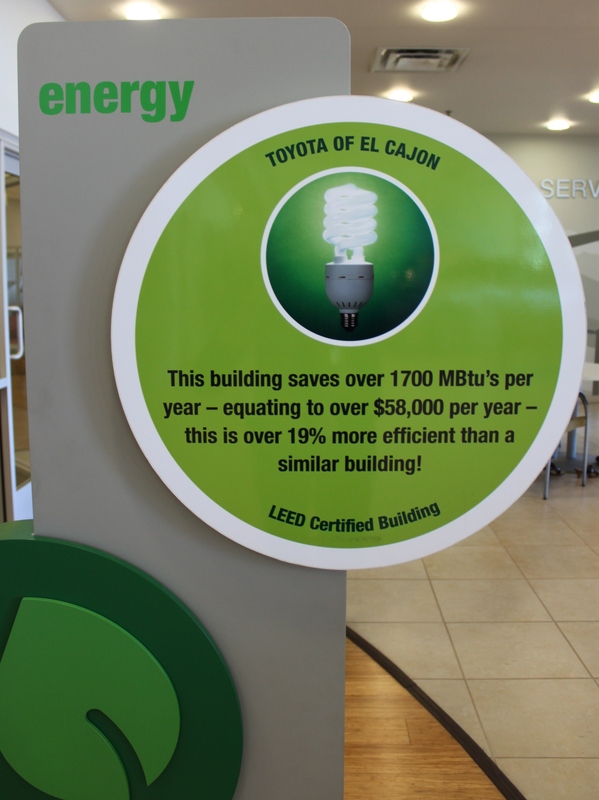 We, at Toyota of El Cajon, pride ourselves in being environmentally conscious. From the production of our facility to our company’s vision, we strive to better the environment and our community. Check out our video to see what we’re all about!